All together it was ugly. And it needed to go. But we didn't have the money for a complete overhaul. #1 - I used found paint. My mom had just moved into a new house that had a ton of cans of paint in the attic. There happen to be two 3/4 full cans of this green color that I liked. #2 - Peel and stick tile. People walk into this kitchen and cannot believe that it's peel and stick. It was so easy and cost $95 for the whole floor. Instead of going for the upgraded trim, I went for the cheap stuff. I trimmed this whole room for $25. #4 - We painted the cabinets. A borrowed paint sprayer and 1 gallon of semi-gloss off white paint. #5 - Cheap counter top. At Home Depot, we just gave them the measurements and they delivered. We saved even more by having a very handy neighbor help us install it. #6 - I reused everything I could. Why buy new drawer pulls and turny-things for the cabinets? I just bought a can of silverish spray paint and took them outside. #7 - We bought appliances off Craigslist. We did end up buying the dishwasher new, it was $125. #8 - Don't forget the details. No...they're cloth napkins that I found on clearance at Target. Held together by safety pins. That and a can of black spray paint can go along way. My whole kitchen remodel for about $640. We were extremely happy with how it turned out. 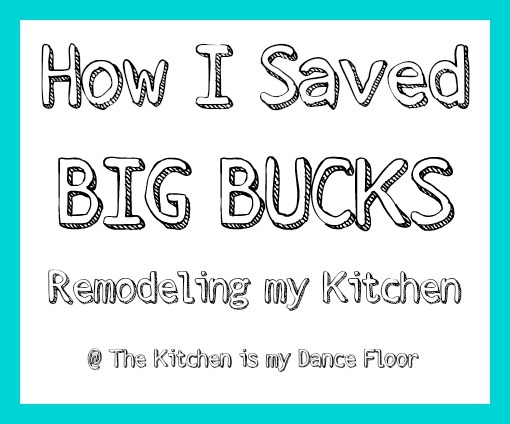 Nobody can believe we spent less then $1,000 considering what our kitchen looked like when we first moved in. so you can see how bad it really was. That's it from me today - have a happy Monday! WOW! Fantastic job on your kitchen, I'm totally impressed! I love your decorating ideas, would love a tutorial on your beautiful art with the mod podge! it looks SO cool! Good idea on the tutorial - thanks so much for stopping by! We are planning on remodeling our kitchen soon. We'll probably just paint the cabinets we have and also the hinges. We used the stick on tile in our laundry room and it looks great. So that's probably what we'll do in the kitchen too. By the way, your kitchen looks awesome and I love the paint color! I might have to do another one and show everyone how - thanks so much for stopping by! Awesome awesome tips for working with what have! I love that peel and stick tile too - it looks great! I'm heading over there now - thanks so much for stopping by! Your kitchen looks so good. You should be really proud of yourself for doing everything at such a great price. 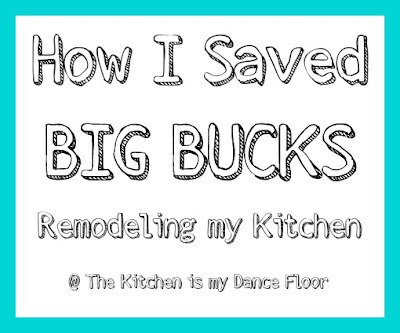 I'm sure this post will inspire others to tackle their own kitchen projects. Very sweet Brandi - thanks! You did a wonderful job. I especially like the BINGO picture. Your pride, and excitement really shines through in your post. Enjoy the new kitchen!! Now this is being smart and thrifty, all right! I salute you for accomplishing all these renovations for a very cheap price! Congratulations! And it's true what you said that while there are things we can still use around the house, why spend when you can just repaint them for that “new” appeal, right? By the way, I got curious about the former look of this kitchen after reading your description about it. Well, I'm glad that you finally started to renovate it. Good job! You've done a terrific job, just goes to show what you can do when money is tight. We were stuck for cash when our kitchen needed renovating, and although we did a lot of the work ourselves we needed to hire processional painters. The painters we found painted the walls as well as the kitchen cabinets, which saved us money. Nice job on your remodel. You certainly did a lot of hard work and you got impressive results, all the more impressive because you were able to do so on such a tight budget. Good work! Some professional help would go better, but all in all this was a good home improvement project. Be careful with using "found" paint though!